Stakes winner All Too Huiying has returned to his best form with a front-running win at Sandown. Stakes winner All Too Huiying has notched his first victory in more than a year, dominating a race from the front at Sandown to upset odds-on favourite Hang Man. 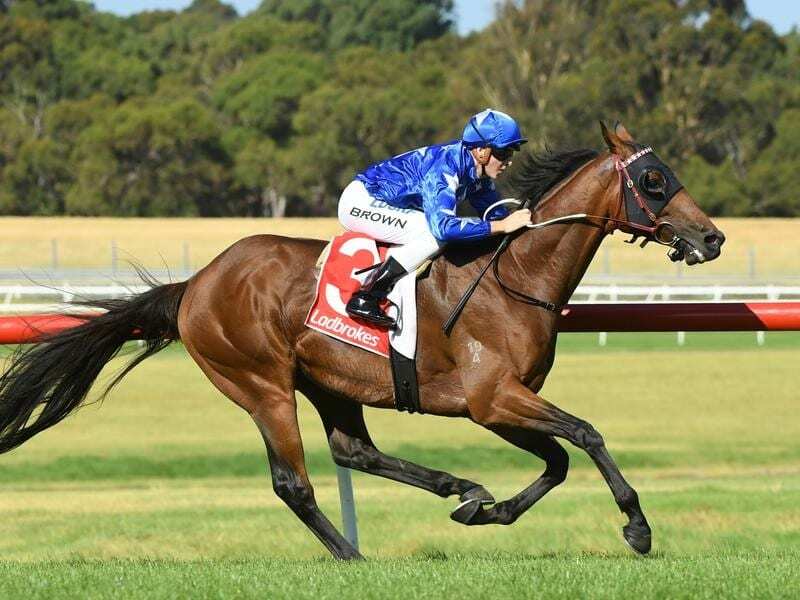 The former Gary Moore-trained four-year-old is in his first preparation for Victoria’s premier trainer Darren Weir and he had blinkers re-applied for Wednesday’s Ladbrokes Handicap (1600m) for the first time this campaign. Apprentce Ethan Brown was able to dictate terms up front on All Too Huiying ($3.60) in the five-horse field and $1.75 favourite Hang Man, who settled at the back of the field, was not able to reel him in after he kicked away strongly early in the home straight. All Too Huiying, having his third start since joining the Weir stable, scored by two lengths over Hang Man with another 2-1/4-lengths to Weather With You third. It was All Too Huiying’s first win since an 1800m Listed race victory against his own age as a spring three-year-old at Flemington in 2017. “I thought he was pretty impressive,” Brown said. “Obviously the blinkers going on did him a lot of favours. “He jumped well, got a nice controlling lead, built momentum down the hill and he gave a good sharp kick off the bend. Three-year-old Street Icon has continued a promising start to her career, easily accounting for her opposition in the Blue Star Print Handicap (1300m) for fillies to remain unbeaten from two starts. With Mark Zahra aboard, $4.40 favourite Street Icon sat on the pace and then dashed clear in the straight to win by 1-3/4-lengths. Street Icon is a younger half-sister to stakes-winning stablemate Bons Away and co-trainer David Eustace says the filly has her share of ability as well but has taken a while to work things out. “She jumped out very well as a two-year-old but we were really patient and put her away,” Eustace said. “I think we’re being rewarded for that now. She probably could have run as a two-year-old but she just wasn’t quite strong enough.